Learn the Peroneal Nerve exploration and decompression surgical technique with step by step instructions on OrthOracle. Our e-learning platform contains high resolution images and a certified CME of the Peroneal Nerve exploration and decompression surgical procedure. The common peroneal nerve is vulnerable to entrapment at the peroneal tunnel as it crosses the fibular neck. There are a number of local structures that may be contributing to compression of this nerve and this guide will demonstrate how to deal with each of these in turn. Extrinsic compression may also result from a lesion such as a ganglion. 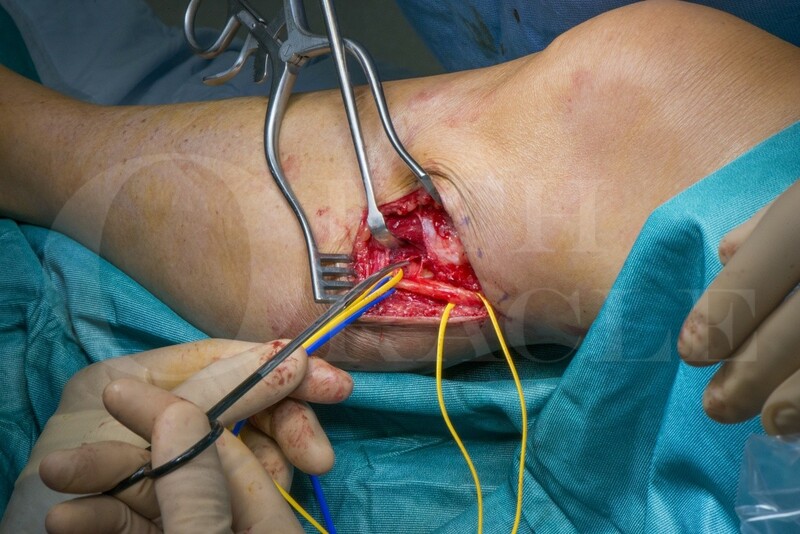 The nerve may also require exploration in this region following trauma about the knee, either direct trauma associated with fracture of the proximal fibula or indirect traction trauma associated with multiligamentous knee dislocation. The peroneal nerve is prone to injury due to the relative tethering of the deep peroneal nerve as it traverses the septum between lateral and anterior compartments of the lower leg. Common peroneal nerve entrapment may result in weakness of the anterior or peroneal muscle groups or pain, parasthaesia and numbness in the cutaneous territories of the deep or superficial peroneal nerves. Entrapment of this nerve may have a variety of causes including local trauma or surgery around the knee. In our experience a great many cases result from a nerve that is recovering from a previous peroneal or sciatic level injury and undergoes ‘auto-entrapment’ in this narrow region, as it increases in volume during the recovery phase. Releasing the nerve in these cases can be rewarding. An immediate improvement in function is occasionally seen, but in more significant lesions to the nerve that may involve demyelination or axonopathy a longer time course for recovery should be expected. For a non-recovering nerve lesion, consideration must be given to reconstructive procedures such as tendon or nerve transfers.